A graph is a collection of nodes, called vertices, connected to each other in some fashion by edges. A graph is called connected if it is possible to find a path along edges from every point to every other point. One on the left is connected, while the one on the right is not connected (there is no path from node 1 to node 3). An edge of a graph is called a bridge if by removing that edge the graph is no longer connected. You are tasked with finding the number of edges, in a graph, that are bridges. 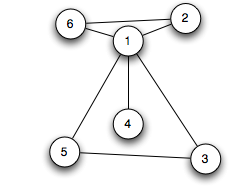 You will be given 5 connected graphs, and you will output 5 single integers for the number of bridges found in graphs. The input file is DATA5.txt. First line will contain a single integer N, number of vertices. Vertices will be numbered 1 to N. 1 <= N <= 100 . Second line will contain a single integer M, number of edges. 0 <= M <= 1000 . Followed by M lines, each describing an edge. An edge is described by two integers, separated by a space. All edges are valid. This format will be repeated 5 times (that is, a line after the last edge of the 1st graph, will be a single integer, describing a number of vertices in the 2nd graph). The output file OUT5.txt will contain 5 lines, a single integer per line -- the number of bridges in the described graph. The only bridge is the edge 1-4.